Since I had some until then unused 80C32 processors at home (for some project that never happened) I decided to make my own 80C32 board (well, I adapted various other designs). The 80C32 doesn't contain any RAM or ROM so programs have to be burned into EPROMS and RAM has to be supplied externally. Also I provided for an RS232 connection and a power supply (not used here). 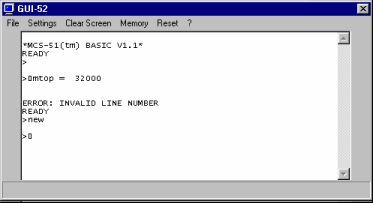 For programming I am using BASCOM-8051: a BASIC language clone, by Mark Albert of MCSELEC . So, I don't have to dive into assembler. By reversing RESET signal polarity one can also use ATMEL AT90S4414/AT90S8515 processors. 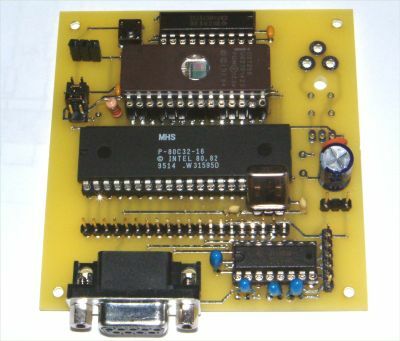 My "JoBot - project" is based on this (old board version). 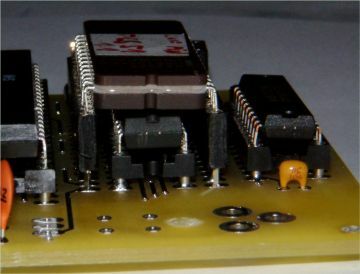 On this picture You can see the "piggy back" arrangement of EPROM and RAM. Works perfectly. I'm running INTEL's MCS-52 Basic on my 80C32. For my convenience I wrote a little "GUI" for it, called "GUI-52". It's running under Windows only. You can download programs and watch the micro execute them (Prompt and messages in the picture are by the 80C32/Basic system). Both GUI and MCS-51 Basic V1.1 can be downloaded here. Click here to download the EAGLE files.